Dhaka, 17 August, Abnews: You probably know Easter Island as “the place with the giant stone heads.” This remote island 2,300 miles off the coast of Chile has long been seen as mysterious—a place where Polynesian seafarers set up camp, built giant statues, and then destroyed their own society through in-fighting and over-exploitation of natural resources. However, a new article in the Journal of Pacific Archaeology hints at a more complex story—by analyzing the chemical makeup of the tools used to create the big stone sculptures, archaeologists found evidence of a sophisticated society where the people shared information and collaborated. The first people arrived on Easter Island (or, in the local language, Rapa Nui) about 900 years ago. “The founding population, according to oral tradition, was two canoes led by the island’s first chief, Hotu Matuʻa,” says Simpson, who is currently on the faculty of the College of DuPage. Over the years, the population rose to the thousands, forming the complex society that carved the statues Easter Island is known for today. These statues, or moai, often referred to as “Easter Island heads,” are actually full-body figures that became partially buried over time. The moai, which represent important Rapa Nui ancestors, number nearly a thousand, and the largest one is over seventy feet tall. 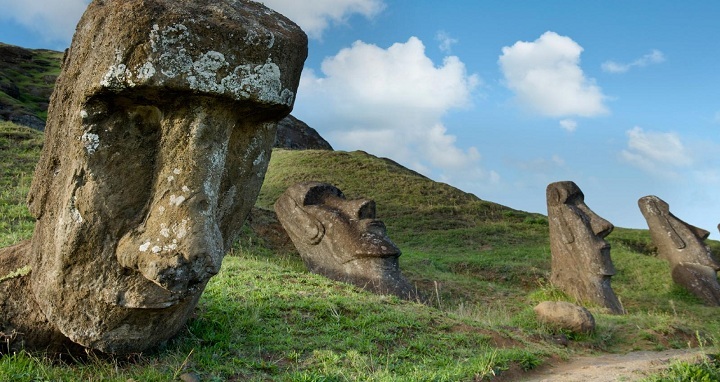 Recent excavations of four statues in the inner region of Rano Raraku, the statue quarry, were conducted by Jo Anne Van Tilburg of Cotsen Institute of Archaeology, UCLA and director of the Easter Island Statue Project, along with her Rapa Nui excavation team. To better understand the society that fabricated two of the statues, Simpson, Dussubieux, and Van Tilburg took a detailed look at twenty-one of about 1,600 stone tools made of volcanic stone called basalt that had been recovered in Van Tilburg’s excavations. About half of the tools, called toki, recovered were fragments that suggested how they were used. To Simpson, this level of large-scale cooperation contradicts the popular narrative that Easter Island’s inhabitants ran out of resources and warred themselves into extinction. “There’s so much mystery around Easter Island, because it’s so isolated, but on the island, people were, and still are, interacting in huge amounts,” says Simpson. While the society was later decimated by colonists and slavery, Rapa Nui culture has persisted. “There are thousands of Rapa Nui people alive today—the society isn’t gone,” Simpson explains.